For the media, the mantra, no, the party line, is that this election is over. You racists, you rubes, you haters should just give up because our “factual poll” shows that Mitt Romney is a weak candidate. From Day One, Mitt Romney’s bid for the presidency has rested on the belief that his ability to turn around faltering businesses would translate into turning around the country. But before he has that chance, it appears the former Massachusetts governor first must turn around his own campaign. A new Dispatch Poll shows him trailing President Barack Obama in bellwether Ohio by 9 points, 51 percent to 42 percent. A surge of Democratic support for Obama has transformed the race since the first Dispatch Poll had the two dead-even at 45 percent just before the Republican National Convention in late August. Read more if you can stomach it…. Yet, when one looks at the internals of this poll, we see anything but random chance. The Dispatch polled 705 Democrats and only 563 Republicans and of the independents, they skewed their vote 3% points towards the Democrats. Then of course, it gets better. Of the Democrats questioned, only 3% said they would vote for the opposition, yet of Republicans, somehow 5% said they would vote for Obama. So let’s get this straight. The Columbus Dispatch over samples Democrats by 142, somehow finds more Republicans who will vote Democrat than Democrats that will vote Republican, and on top of that, the independents they sample skew towards Obama. Can any reasonable person believe this model of an electorate in Ohio which voted in a Republican Governor, a Republican House, and a Republican Senate in 2010? Second, look at the distribution of those polled (screenshot directly taken from Columbus Dispatch article linked above). 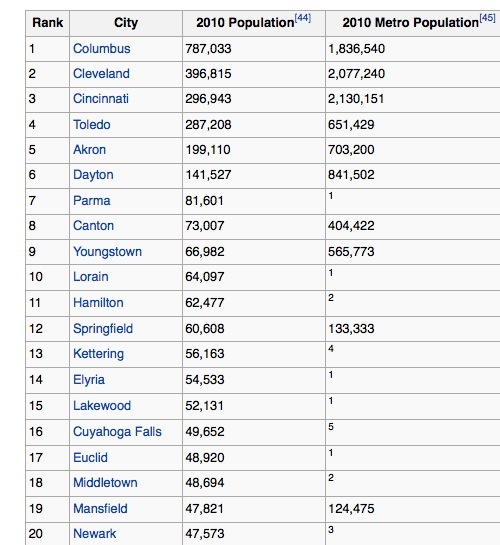 Looking at these numbers, Northeast Ohio (greater Cleveland) and Central Ohio (greater Columbus) must be the population centers of the state while Southwest Ohio (greater Cincinnati) must be a backwater? Right? Contrary to the Dispatch’s methodology, the Greater Cincinnati metropolitan area has a larger population than either Columbus or Cleveland, yet in the Columbus Dispatch poll, only 182 individuals were sampled from the Cincinnati area. Inexplicably, 628 people were polled from the Cleveland area and 491 from greater Columbus. That certainly doesn’t look like a random sample to me. In fact it isn’t. 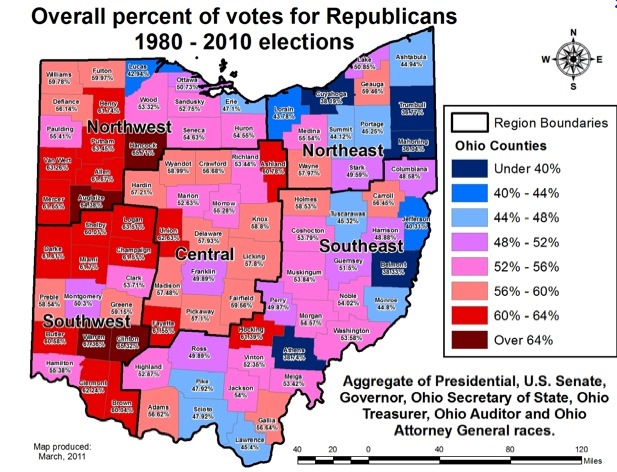 It is purposeful, because Columbus and Cleveland vote overwhelmingly Democratic, while Southwestern Ohio votes Republican (as well as western Ohio). Looking at the map above, it is painfully obvious that the Columbus Dispatch went out of their way to pack their poll with people from Democratic voting areas. I’m not a polling expert, but from what I remember from graduate classes on taking samples is that polls should strive to be honest and random and the results from the process are the results–like them or not. You know, the scientific method where you test a theory to prove a result instead of starting from the desired result and creating a theory. Here, we have a poll that is skewed towards the Democrat Obama, and there is no statistical or professional explanation available which can explain this methodology–except that it is strictly an exercise in outright partisanship for Barack Obama disguised as objective journalism. After all, can anyone believe in 2010, in a state, during an extremely tight election, where a not extremely popular John Kasich beat incumbent Governor, Democrat, Ted Strickland, 49% to 47%, that Republicans lost support of some 7% of Ohio’s population? Can you really believe that Republicans are only 34% of the state’s voters while Democrats make up 42% of likely voters? And, add to that, independent voters will break for Obama as well…. That notion stretches all credulity. 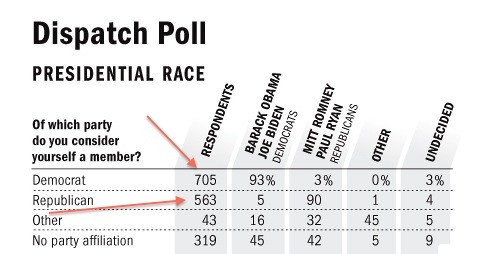 If one inserted less biased turnout scenarios into this poll, Romney is probably well within the margin of error. In other words, it is a dog fight despite what our leftist press prints. I’m not saying that Mitt Romney will win Ohio, I’m just noting that this is a highly partisan poll, dressed up as objective reporting, that should be given all the credibility that its methodology deserves. not to mention that the southeast part of the state is coal country and despise obama’s energy policies.